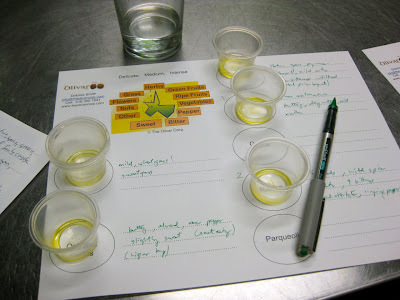 Did you know that olive oil can be judged by criteria similar to tasting wine? It never crossed our minds until we came upon an opportunity to sample some remarkably exquisite oils from Spain. Olive oil expert Dolores Smith walked us through the art of olive oil tasting with a variety of high-end oils from Olivar Corp., with particular attention to the two latest additions to their collection: Full Moon, and Oro San Carlos. These oils have a C.V. like an award winning chef. 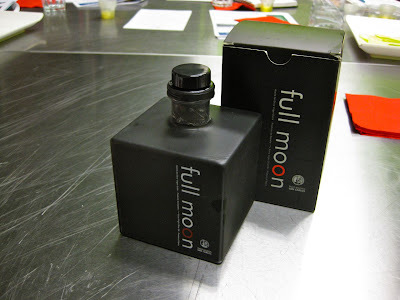 In fact, Full Moon is used by Michelin 3 Star chefs including Ferran Adria at his Hacienda Benazuza in San Lucar La Mayor, Seville. Full Moon uses Arbequina olives that are picked during the full moon in September or October. In it's first year of production, this auspicious event occurred at 6:00 a.m. on October 4, 2009. According to its maker, Pago de los Baldios de San Carlos, the idea behind this process is that this is when the olives are sufficiently ripe (yet green enough) to produce an oil of unparalleled aroma and flavour. But here's a secret: the back story is that by harvesting this way, the oil is imparted with aphrodisiacal properties... shhhh. One of the first steps to tasting olive oil is to warm your cup in the palm on your hand while covering it with the other. This releases some of those lovely compounds from the liquid while trapping them in the cup, ready for you to smell and taste. You can sense the oil's terroir, or the character imparted upon it by its geographical provenance. The ripeness of the olives at processing, the olives' varietals, and a whole host of variables that come together to make the final product can be appreciated in fine detail. But just as important as the good stuff, we're told that connoisseurs also look for faults like metallic taste from processing, excessive humidity, damaged olives, even insect infestation. We gleefully sampled and compared various oils and examined the different levels of grassiness, boldness, sweetness, and pepperiness. We were searching for hints of almond, banana, milk, citrus, apple, and even strawberry. My favourite, Ame, had a buttery, milky, nutty profile, with a taste of melon. Can you believe it? Melon! Another good one, Rincon, left a lingering heat on your tongue, and had a pleasant aftertaste. We also learned that depending on the olive varietal or blend of varietals used, a specific flavour profile and smoke point can be achieved. Some olives actually make for higher temperature oils that can be used for deep frying, while other oils are more suitable for use after cooking. After sampling the oils, we got to try them in action with a great spread of tapas from chef Lola Csullog-Fernandez, owner of Pimenton (and holder of a Masters of Spanish Gastronomy). A crowd favourite was the Salchichon & Chorizo Iberico Fermin, made from the famous black and fatty Iberico pigs a.k.a. olive oil on legs. The tapas went down with a selection of excellent Spanish wines. I particularly liked a bright and fruity red made with a blend of tempranillo, cabernet sauvignon, and merlot. That was a wonderful learning experience, and definitely broadened our sensory repertoires. I'll never see olive oil the same way again. Wow! The tapas spread looked delicious. I regret not being able to attend. I, too, will now look at olive oil differently. Looks cool - must admit I've never thought of tasting olive oil either until wandering around Queen St. W this weekend and going into The Olive Pit (same location as The Spice Trader). They specialise in olive oil and have a whole table of olive oils available as well as olives for tasting. The Peruvian olives were excellent. Great video! My post is up. Wish I was there! I stumbled across my discovery of premium olive oils online at www.oliveoilemporium.com - delicious!